“I do it for the snaps,” Justin Simien laughed, responding to all the praise season two of his hit Netflix dramedy, Dear White People, has garnered. 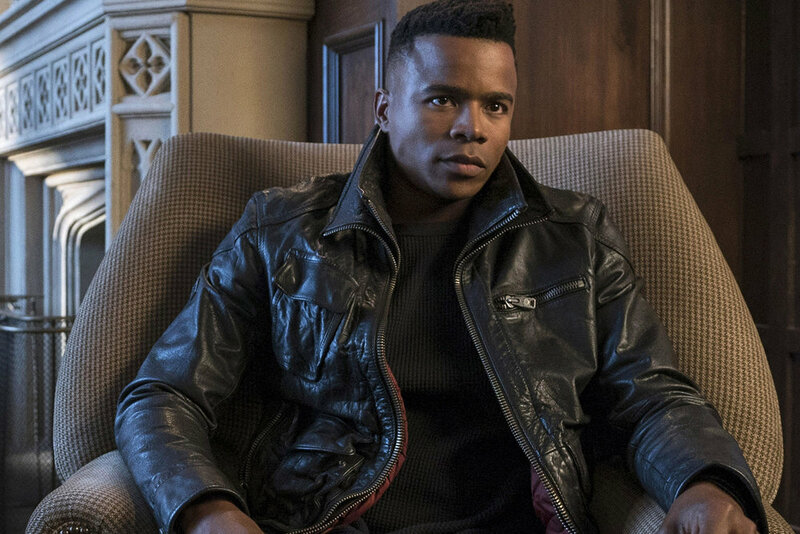 Recently, Simien spoke to ESSENCE for an in-depth interview, discussing each episode of the new season of the show, “the one thing we went into season two with was [the idea that] ‘we really can’t rest on the reviews of season one, we can’t rest on the laurels, we really have to outdo ourselves and go deeper, and go further, and respond to an urgent time.’” Season two does not disappoint. So, here is a deep-dive, decoding messaging, discussing themes, and asking questions about everything season two throws at us, all the way up to that cliffhanger you couldn’t have seen coming — and even a glimpse into what it means for season three. We’ve broken it down by episode to make it easier for you to jump to your favorites, follow along with where you are in the season or go straight through it. A warning: This conversation literally discusses every spoiler. If you’re in the process of watching the series, we’ve marked the dialogue to show where we are episode-by-episode, to help you along the way. "I dealt with a lot of alt-right BS in the first season, and I was just so… at first taken aback, but then fascinated by the way that outrage has been weaponized in the years since the movie and the series,” Simien said of approaching the reintroduction to the series. “What started off as genuine ignorance and all that crap, became people who were intentionally lying to their base about what the show was." Simien saw his show becoming a building block for the alt-right and backlash in the comments, the ratings, and every place they could speak out against it — he and the team of writers saw that as what Sam (Logan Browning) would likely be encountering. That reality found its way into the episode in many ways, one of which literally speaking to the campus in a right-wing counter-show on the college station called Dear Right People. Chapter 2 explores the reality of what usually doesn’t make news after a person is shot and killed by the police, or is the victim of police violence or over-reach, and then has to go on with their life: that life goes on, albeit changed. The writers and Simien felt they couldn’t ignore what so many Black men and women experience after the impact of a traumatic experience. The third episode sees Lionel (DeRon Horton) beginning to explore being out, gay, and Black at Winchester. Dealing with a common misconception that the gay experience is ubiquitous, monolithic, and open to everyone who opens their closet door, the episode takes Lionel through the realization that coming out is only the beginning. Simien wanted to show a character navigating the nuances of being gay, and to air his grievances with the encounters he, and many gay people, have experienced. One of those moments sees Lionel meeting another Black gay male student journalist while out. 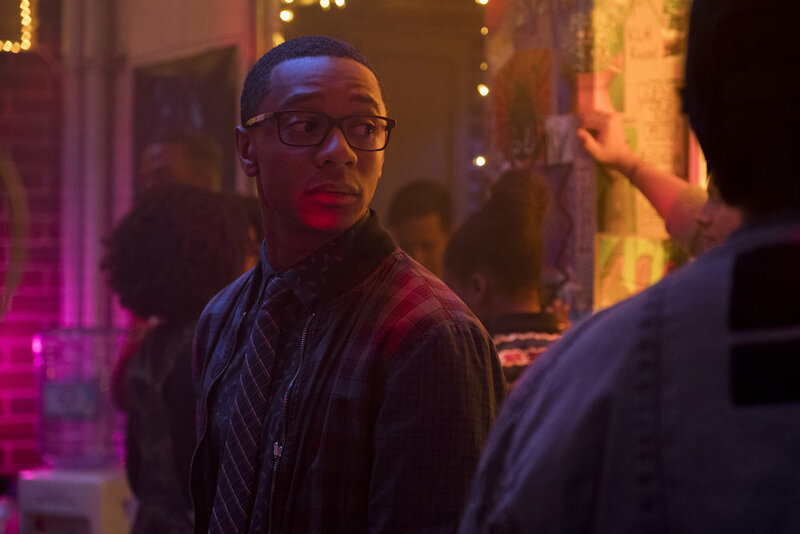 The two men strike up a conversation and seem to have a chemistry — until he drops the bomb, "No shade, but I’m not like, into other Black guys, just an FYI," the character informs Lionel. "I can’t tell you how many times I’ve encountered that. It’s a bizarre arena that has really not been explored fully," Simien emphasizes. In this episode, Coco (Antoinette Robertson) is the center of the universe. “A couple writers had this idea that she should get pregnant and they brought it to me like ‘you’re not gonna like this, but….’” Simien recalled. He explained this plot twist was ultimately attractive due to the old school stigmas surrounding such circumstances. The idea that when women get pregnant and have to make the choice to have the baby or have an abortion, there are unique aspects of Blackness that aren’t seen on television. An unexpected twist in this episode is when Kelsey (Nia Jervier) casually comes out as a lesbian, sparking conversation online about seeing an unconventional image of a Black lesbian. Simien felt “Black lesbians really don’t occupy enough space in our culture, and I’m not a Black lesbian, so I’m not making The Black Lesbian Show, but in a show where all of the characters are dealing with a singular point of view, I thought it would interesting to at least begin to open that door, so we can get into it potentially in later seasons.” Simien said he believes one job of his show is to take the judgments viewers make about the characters and take you beyond and beneath them. Actress Ashley Blaine Featherson’s much-awaited episode gives us Joelle’s perspective — and the first time we see her with a love interest (who is actually paying attention). Simien said “this one was for the Kellys.” He wanted to explore the experience of being gorgeous, talented, and darker brown-skinned and how so often the lighter-skinned friend gets more attention and popularity. The show has fans who can relate to her, which is why, from the beginning, she was always intended to be developed and get her own perspective. Joelle’s character is “a fun character. She doesn’t have a chip on her shoulder, she’s incredibly erudite and intelligent, and well-adjusted.” The focus was showing that that girl has difficulty as well. Shamier Anderson, who plays Joelle’s doting classmate, Trevor King, got the role only partly because of their chemistry and the charm he brought to the character. Featherson’s version of the song is part of the soundtrack which is available on Spotfiy. Simien lead this episode, his first time directing a ‘noir’-style piece. We see Lionel and Brooke (Courtney Sauls) begin an arc that will last to the end of the season, as they unearth the question of whether or not a secret society has existed, and may still be operating at Winchester. But what may truly be the breakout of Chapter 6 is Sauls’ portrayal of Brooke. Simien says they loved the pairing of Lionel with Brooke because she’s the perfect foil for him. “She is outspoken, overly driven, she dominates a conversation. Where Lionel is sexually inhibited, she has NO inhibitions,” he laughed. “She’s an unlikely ally for him, [because] we always hate the people that show sort of show us who we need to be and I think Brooke is that for Lionel.” The pairing of the duo became “irresistible” to the writers while putting together the episode. Troy also leads the seventh episode and he’s become “a shell” of a person because of his father’s (Dean Fairbanks) overprotection. Simien said that the end of last season saw that shell being cracked open — quite literally with the breaking of the windows. “We wanted to see what was [beneath] that,” Simien began, “so often underneath the roles that straight men play are boys who really haven’t had a chance to figure out what they want [and] who they would be if they weren’t so busy being all the things that they’re supposed to be.” And what better way to delve into someone’s psyche than with a ‘shroom trip, right? Dean Fairbanks, played by Obba Babatundé, introduces Troy to what Troy would call “the Black Illuminati,” the secret society that Lionel, Brooke, and later Sam are looking for. Simien talked about the high stakes for Black wealthy people, having to represent so much for the culture, and also themselves, and the need to hold onto the power they have and Dean Fairbanks’ goal of trying to instill and pass that along to Troy. In what is called a “bottle episode” (an episode that stays within a show’s original set(s) and using only the series regulars), Sam & Gabe have the interaction that has been coming since their breakup last season. Simien was excited about the idea of locking them in a room. The writer of the episode, Jack Moore, has a playwriting background, which helped with crafting the story of Chapter 8. You might also notice this episode features two characters and almost no music. “It felt like anything more than the two of them would have been beside the point, breaking that tension,” he added. The two characters’ discussion, or argument, or interview, or… all of the above was representative of the debate within the writers’ room: What are both characters upset about and what do they have a right to be upset about? The writers wanted to make sure nobody was clearly the winner. The summation of the argument, Simien said, was both characters trying to figure out if they could trust the other because they loved one another. “These are two people that, if it weren’t for the society they live in, would just be together,” Simien said. “In a lot of ways it’s about the things that keep us apart, the things that are important, the ways in which we want to feel heard, it’s about listening, and it’s about what a conclusion can look like because so many of us never get there when we have these conversations.” Then, Joelle shows up telling her she’s got to go home. Her dad has died. from Family Matters) plays Sam’s aunt, greeting her at the door; Wendy Racquel-Robinson (The Game, The Steve Harvey Show) is cast as Sam’s mother. And the resemblance, frankly, is there. One of the important moments for the writing team was when Sam hears her dad while going through his things, as some of the writers have experienced the loss of a parent. “The voices of our parents live on in our heads forever, no matter if we want them to or not,” he said laughing again. “Seeing someone thinking is hard to portray in a show, but that’s what she would be doing, she’d be absorbing this moment, kind of quietly [and silently]." Simien said he asked himself “what is Ann Coulter like when she goes home at night and is talking to JJ [Watt]?” when thinking of the backstage debate. Another curveball you couldn’t have seen coming: Kurt (Wyatt Nash) hooking up with Coco, an event Simien calls “an Yvette Lee Bowser special.” “That was one of the things where she [said], ‘Ok, you’re going to think this is crazy, but…’ and I was like ‘no, I don’t think it’s crazy at all.’” He said it made sense in the writer’s room because they keep pushing the limits of who we believe these characters truly are. We also got to see Joelle and Reggie finally get together. “In a show where we deal with so many interracial relationships, it was important to just have a solid Black on Black love situation go down, that wasn’t complicated,” Simien said, acknowledging that they’re aware they’ve been teasing this out for a long time, but have enjoyed making the audience wait for it. Also, the interesting question arises of whether Sam will feel something about the budding relationship in the next season. As the episode and the season comes to a close, Lionel and Sam come to what they believe is the center of the secret society they’ve been looking for — only to find nothing. Until someone finds them. Out walks the yet unnamed series narrator (the ever mysterious-looking, Giancarlo Esposito) we’ve been spoken to for now two seasons. Something we may have missed, that was seemingly hinted at in the title card of the episode, this chapter seems to be told from his somewhat-removed perspective. Was that always the plan!? Justin said he and the team have a certain idea about where that will take us…but we’ll have to wait for the third season. The entire second season of Dear White People is on Netflix now!